The following post is an updated and reedited version of a 2014 post made all the more prescient by the Trump administration and other troubling events in the world today. Valentines day is an opportunity to express love to people we care about, the day should also be about finding ways of communicating our love for the planet and gratitude for those who work to make a better world. While we need to come to terms with the obstacles we face we must also muster hope that we can do better. The climate crisis has been trumped by a supremely dysfunctional American administration that is not only wreaking havoc with our planet but dividing us in ways that make progress seem impossible. The crisis we face today is a crisis of love. 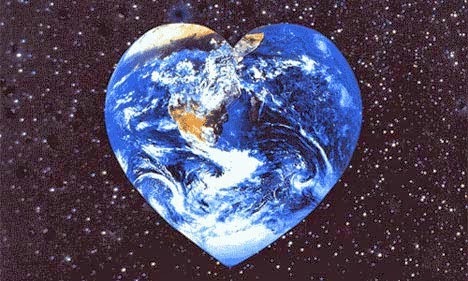 Love for each other and love for the Earth upon which we all depend for our sustenance. No matter where we are, regardless of our power or wealth, we are all dependent on the planet and each other. Although the malfeasance of the Trump administration is profound, this nightmare will end. We have the capacity to resist hate and ultimately triumph against the forces of darkness. Hope, love and gratitude are a bulwark against the intolerance and hate coming out of the Trump administration. We have many reasons to be grateful. We are crafting positive environmental narratives that are getting more people on-board. A movement is being born that is infused with what can only be described as "eco-morality". A new religious psychology and ethics is emerging that reinforces the environmental message. The new breed of environmentally concerned citizens gives us reason to hope that we will address the difficult issues we face. Despite the chaos and disarray in the US and elsewhere we have made progress on some of the most serious environmental issues of our time. Over the course of the last few decades we have witnessed some impressive environmental success stories. It is important to know that however difficult it may seem at present, we can live in harmony with the planet. Much of this progress is attributable to people who work tirelessly on behalf of the planet and its inhabitants. We should be grateful to those who advocate for the Earth. These efforts reveal that there is a powerful relationship between environmental gratitude and ecological advocacy. A heartfelt and well deserved thank you goes out to all who work to help protect our environment and our climate. We also give thanks to indigenous people who have so much to teach us about environmental stewardship. We are increasingly understanding that indigenous ecology is essential to environmental education. We are seeing more cooperation in water management and a host of solutions to the world water crisis including solutions to diminishing ground water. Industries are also increasingly engaged in water management. We are coming to terms with the complex yet vital role of forests in the health of the planet including a number of economic and employment benefits. The business community is also beginning to appreciate that there is much they can do to protect our forests. The business community is coming to terms with the business case for conserving nature. A growing body of research corroborates the value of environmental sustainability and a growing number of businesses are embracing sustainability in their strategic orientation. Across the board leading businesses are engaging in more ethical approaches to commerce. We are also seeing progress in a number of other areas including a growing green building movement. We have reason to be grateful for the brave pioneers who have championed sustainability long before it was fashionable. This includes men like Ray Anderson, who made the business case for sustainability many years ago and companies like Patagonia that have been showing us the way for almost 50 years. We are seeing a wave of sustainability leadership and corporate goodness. Businesses are reducing their footprints and acting to combat climate change. In the US corporate climate efforts give us reason to believe that we can do better even in the absence of responsible political leadership. Corporate leaders are combating Trump's ignorance and resisting this destructive administration. Companies like Amadeus, HSBC, Mars, BMW, GlaxoSmithKline, and Unilever show that the corporate world can play a leadership role in these dark times. This gives us reason to hope.